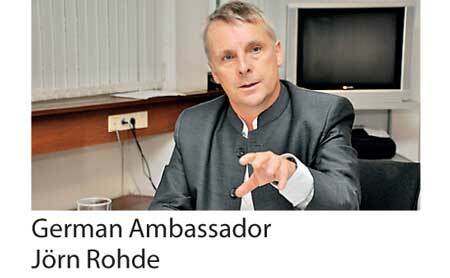 German Ambassador to Sri Lanka Jorn Rohde opines that Sri Lanka is on the right path with its policy strategy, but it is high time for the nation and its leaders to ‘walk the talk’. Rohde says that the international community is fully supportive of Sri Lanka’s ambition to become the regional hub – and possesses every opportunity to do so – but the country must give effect to serious improvements in the sphere of governance if it were to transform this dream into reality. He points to examples such as Hong Kong and Singapore, which took off because they put in place the right governance infrastructure. Be it the legal system, trade or other sectors, the zero tolerance of corruption coupled with sustainable policies on all fronts have seen these tiger economies surpass nations like Sri Lanka, which have failed to capitalise on potential. Everyone country – big or small – faces numerous challenges, but sustainable policies and political will have seen them through. “Everybody knows what has to be done, it just has to be done,” Rohde adds. “I believe the primary message is that the Government must create a level playing field. Rules should apply to everyone. To achieve hub status, you need legal and physical infrastructure that is sustainable. The economy must open up in a hub like in Singapore or Hong Kong that have low tax regimes and adequate infrastructure, and index such as corruption is very low. The Sri Lankan Government is trying to open up as evidenced by the Inland Revenue Bill, the Foreign Exchange Act and attempts with Free Trade negotiationsand we support it,” Rohde states. Delving further, the German Ambassador provided examples for a number of areas in which the Government could take steps to improve trade and investor confidence. One such area was the automobile sector, in which the country holds significant interest, where official dealers complain of parallel imports that now dominate more than 50% of the market, he says. The Government has said it would address this issue, but again it must ‘walk the talk,’the Ambassador says. “Whatever the country or the company, there has to be a level playing field. They don’t mind competition. When I look at this Fundamental Rights case, the other company is stating that Linde cannot even file here. They are not protesting the case, they are protesting a foreign company. This can be a test case whether Sri Lanka is an investor-friendly country, and especially in a field which involves human life,” Rohde states. Speaking further, Ambassador Rohde adds that Germany will open up a joint Chamber of Commerce in Colombo during the early part of 2018 that would take trade relations between the two countries on to a different footing. Trade between Sri Lanka and Germany had reached $ 700 million in 2014 and topped $ 900 million last year. This year, the figure is billed to top the $ 1.2 billion mark, with German exports growing almost 90%, whilst Sri Lankan exports to the European nation are also growing at double digits driven by textiles. The numbers are primarily trade figures and not investment, laments the Ambassador, expressing hope that steps could be taken to enhance performance in this respect. Sri Lanka has the best social and economic indicators in the South Asia, and Colombo is one of the most liveable cities in the region, he adds. There are issues in neighbouringcountries like India, but it has the advantage of being the big market, whilst countries like Singapore and Hong Kong win on effectiveness and infrastructure. “It’s not rocket science, and I think Sri Lanka can do it,” he says. “Sri Lanka’s competitive advantage is its sound educational system. The country scores on socioeconomic indicators, health, you are at the centre of trade routes and have bigger land mass than Singapore. You must exploit these advantages, but it also needs the right legal parameters;the indexes on red tape and corruption have to be right. Sri Lanka’s textile industry is the best example because it is open to global competition, its creative and part of a global chain where they can react very fast. Look at the export industries of Sri Lanka and Vietnam over the last 25 years. Sri Lanka’s export portfolio still has rubber, textiles and tea whilst the others have diversified. Rohde avers that the new Inland Revenue Bill will help Sri Lanka expand its tax base, as it is too reliant on import cesses in a regime where the share of exports over GDP has fallen dramatically. Modern governments should rely on Value Added Taxes and Income Taxes, Rohde opines, adding that every successful society has a secure tax base. He points to the German example and that of Scandinavian countries, which have high taxes but are still producing at well over 22% of GDP due to their state-of-the-art facilities and environment and are globally competitive. It is difficult to determine what industries are the best for Sri Lanka, but Rohde urges the need for manufacturing plants to retain technical skills in the country, pointing out that in the modern digital milieu, manufacturing is merging heavily with Information Technology. The Ambassador feels that persons engaged in the IT sector in Sri Lanka have a number of advantages, including attractive remuneration, which the country could exploit. It is also important to create a conducive environment for companies to set up regional or global headquarters in Sri Lanka. He also stresses the need to further upgrade skills islandwide, pointing out that only 50% of women participate in industry whereas it is high as 80% in developed markets. Rohde reminds of Germany’s contribution to develop technical skills in the country via the popular German Technical Institute, which opened a centre in Kilinochchi and will open another in the south near Mattala next year. Commenting further on matters of governance, Ambassador Rohde adds: “As said by the UN Rapporteur, the issues from 2015 are still on the table but the process is moving. We have had some results on the Office of Missing Persons and land returns. Is it happening fast enough? No. The Government needs to be transparent. The land returns happened, but of course for the people who wait it is never fast enough. The Government is on the right track, but it must now walk the talk, he asserts.